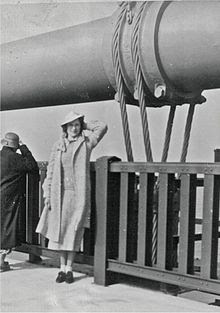 Seventy-five years ago today, May 27, 1937, the Golden Gate Bridge opened and San Francisco, CA would never be the same. Tens of thousands of participants are expected at the historic celebration along the San Francisco waterfront to celebrate on this Memorial Day holiday weekend. The iconic Golden Gate Bridge is a suspension bridge spanning the Golden Gate, the opening of the San Francisco Bay into the Pacific Ocean. It has been declared one of the modern Wonders of the World by the American Society of Civil Engineers. The Frommers travel guide considers the Golden Gate Bridge "possibly the most beautiful, certainly the most photographed, bridge in the world". Construction began on January 5, 1933 and cost more than $35 million. Four and a half years later, the Golden Gate Bridge opened on May 27, 1937. When completed, the Golden Gate Bridge had the longest suspension bridge main span in the world, at 4,200 feet (1,280.2 m). Since 1964, its main span length has been surpassed by eight other bridges. However, it still has the second longest main span in the United States, after the Verrazano-Narrows Bridge in New York City. 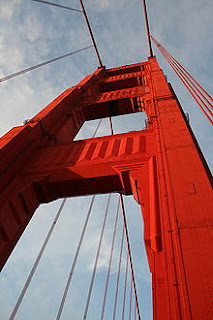 At 692 feet (211m) (above water), the Golden Gate Bridge also had the world's tallest suspension towers when built. It held that status until 1998, with the completion of bridges in Denmark and Japan. ►WSJ, Birthday Bash Planned for Bridge, But Will the Golden Gate Show? Interesting post. Didn't realize the Golden Gate was built during the depression era. Always loved this bridge. Interesting blog post. I enjoyed reading this blog post. To think it took 4 ½ years to build the bridge back in 1933, during the days of the depression. This is really a beautiful bridge, smog, fog and all.